Introducing model Eleven from the Dojo Pro bo-hi series, this particular designs main feature is its plum themed black iron tsuba and traditional black colororation. 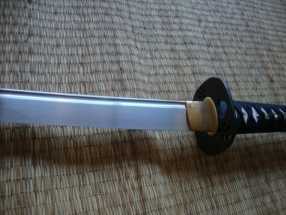 In all other respects the swords in the bo-hi series are exactly the same as the classic solid bodied blade Dotanuki Katana. They have the same solid iron fittings and REAL silk ito wrap for maximum handle strength and integrity. They also have the same buffalo horn reinforced saya and hard wearing, super thick sageo wrap and in short, the only difference is the addition of a bo-hi (also known as a fuller or blood groove) but what makes it so special is that this is no ordinary bo-hi. At considerable expense, the Dojo pro bo-hi series have a properly channelled, hand made bo-hi instead of the usual "shortcut" method. While it may not seem like a massive difference, the reality is that this upgrade gives the sword an authentic Tachi Kaze (sword wind sound - i.e. the wooshing sound the blade makes as it cuts the air) unlike any other sword in this price range and of course, provides an option for anyone who wants a Dojo Pro Katana with a little more speed and responsiveness than the solid bodied blade classic model. My first purchase was the #14. I chose that one for the length. I am an average guy at 5' 10" and have used a 2.45 shaku iaito for the last 5 years of my 28 years of practice. 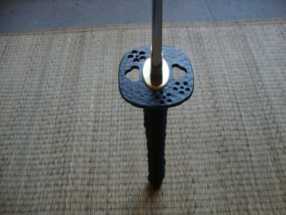 Previously I used a 2.40 shaku blade. So the 30" length of the #14 seemed an ok compromise. 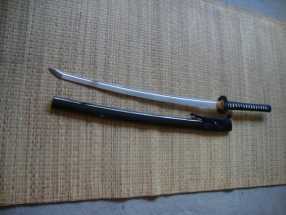 The #14 turns out to be a heavy blade with a tip heavy feel to it when taking it through the kata. I decided to try the much shorter #11 with the bo-hi and found it to be a much better feel in the hands, light and well balanced. 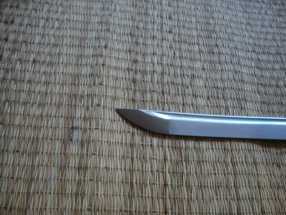 The shorter length means I have had to be extra careful during noto after practicing with much longer blades. I will stick with it, however, as the feel is quite good. I am not very interested in cutting so I won't comment on its value there. I do think it is a very good option for those who are tired of drawing the aluminum alloy iaitos. I also like the profile of Ronin blades. Some Chinese katana look like there is a curve to about the last third of the blade then it is straight from that point forward to the tip. 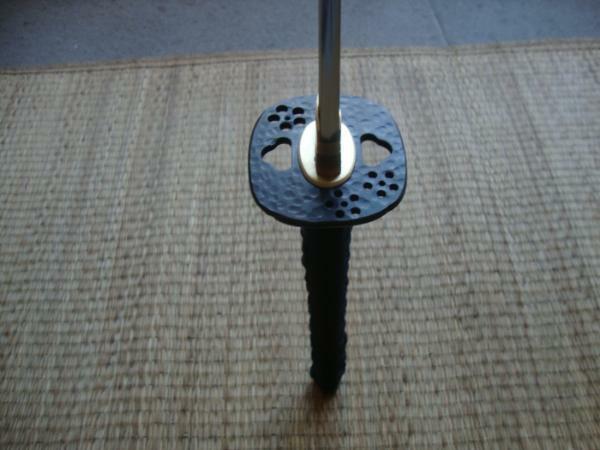 I like the gentle even curve of the Ronin blades. If I had a wish it would be for the #11 to have a big brother #11.5 with an added inch or even 1.5 inches. Making it closer to what I am used to drawing. The #14 with a bo-hi would do it. The tsuka of the #14 is both too long and too narrow in both dimensions for my hands while the #11 is just right. I would prefer the black over the red saya as well. Both swords were tight. The shitodome on both #11 and #14 had to be re-glued. The Kuri-kata on the #14 had to be re-glued to the saya. 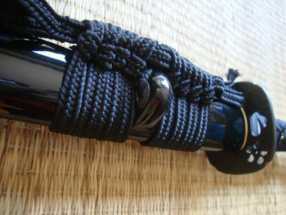 On the #14 when I unwrapped the sageo from the saya I found ink had transfered from the cord to the saya. This does not come off easily so the red shows wrapping marks. 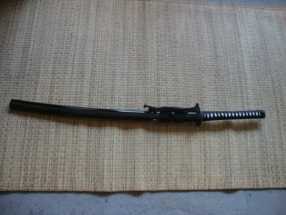 It does take quite a while to clean the cosmoline, or whatever they use to store the blade, from the inside of the saya. The #11 fit snugly into the saya while the #14 was quite loose and would not stay in the saya on its own. For the money the Dojo Pro blades are a fine alternative to purpose made iaito which can be quite a bit more expensive. I have held $1500 iaito and found them to be pretty but otherwise unexceptional and without the feel of a true steel blade. Since I won't be hacking up the back yard trees with this sword (the #11) I expect it will likely last a good 20 years or more.